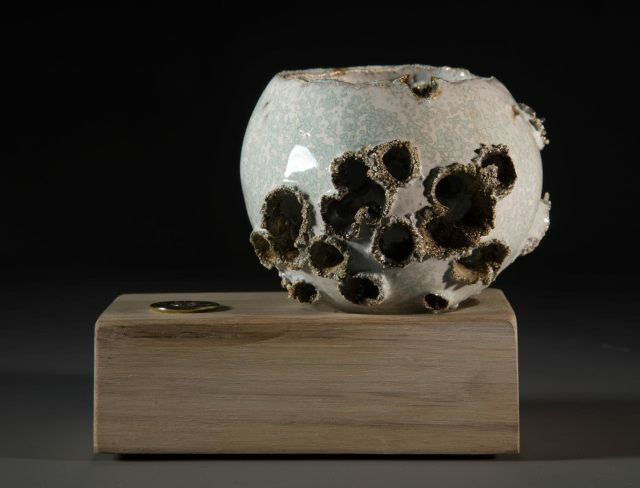 Ceramic artist Allison Weightman is known for her mastery of form, raku techniques and exquisite glazes. She delights in the unexpected elements and raw energy of working with clay, minerals and fire. Weightman’s hand-built sculptures meld ancient craft, contemporary innovation and cutting-edge ideas to create works of sensitivity and strength. In her latest work, Weightman explores richly layered glazes to evoke the emotive depth and subtle, ever changing hues of the Northern landscape. Voluptuous hand-built vessels and delicate porcelain combine the sublime simplicity of Japanese art with a uniquely Scottish palette. One of the artist’s more unusual tools Weightman uses is a shotgun; peppering clay with explosive entry and exit wounds. Initially the elevated beauty of lunar forms draws you in. Then, as you move closer, the violent nature of these marks become apparent. “Some cultures believe that man was modelled from the clay that is our earth,” explains Weightman. “This is the reason why I felt it appropriate to use leather-hard clay which has an outer skin giving the work strength and a soft interior”. Allison Weightman graduated from Edinburgh College of Art in 2005 and lived for many years on the Scoraig Peninsula, Northwest Scotland. Recently she returned to Edinburgh. Weightman has exhibited widely and is represented in private and public collections across the UK and Europe.